It is a rare privilege to revisit your very first research project more than four decades later. And it is a poignant addition to consider that the animal you studied so many years ago might well be extinct in that region. In 2017, with the support of SOSF, I returned to the project I had set my heart on in 1974. 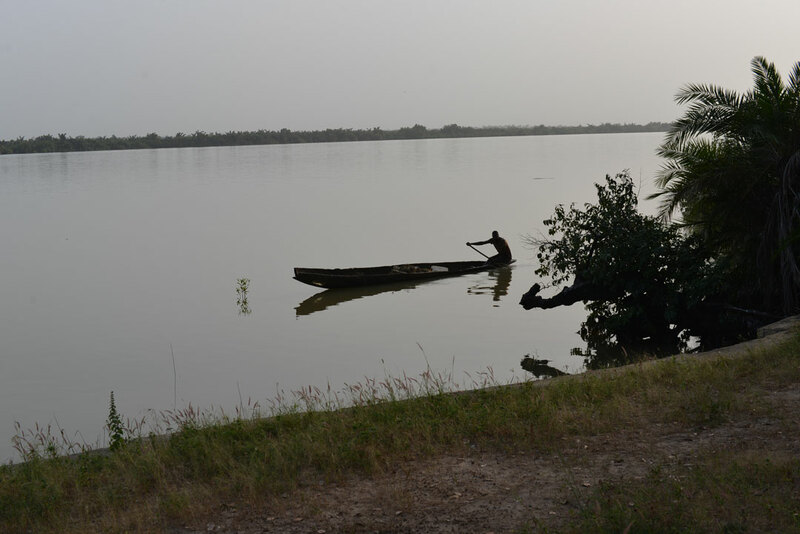 Back then, sawfish were plentiful in the Gambia River and to the south in Senegal’s Casamance River. 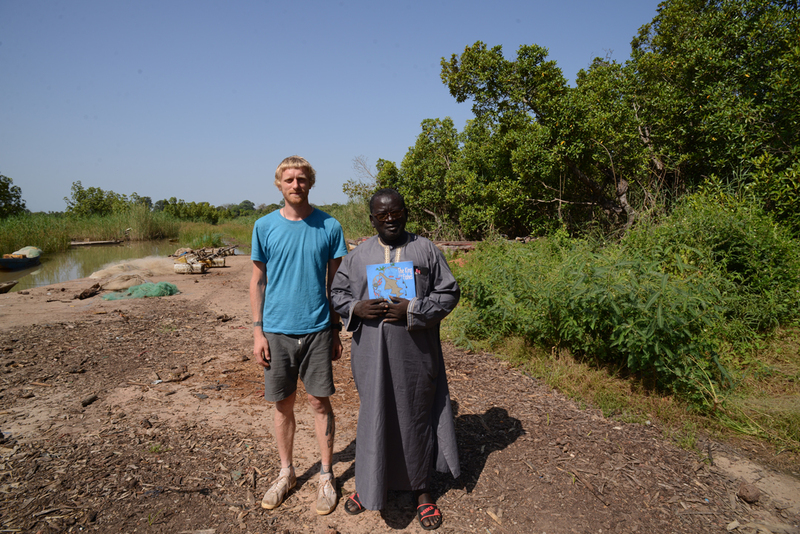 For my PhD I wanted to discover how sawfish tolerate fresh water, and I headed out to West Africa to study them. In the 1960s and 1970s comparative physiology was the rage in the Department of Zoology, Cambridge. I was intrigued by how sharks and rays managed the physiological transition from sea water to fresh water and back again. The master practitioner was the bull shark, Carcharhinus leucas. It was known from many rivers and even lakes around the world. Its record fresh water incursion was over 1,000km up the Amazon. My 1974 project attracted the attention, and funding, of Dr Jean Maetz, head of the Villefranche-sur-Mer French Atomic Energy Authority Laboratory. They were using radioisotopes to track the ion and water transfer into and out of various bony fish (teleosts). The unsolved mystery of how cartilaginous fish (sharks and rays) adapt between fresh and salt water intrigued Dr Maetz. The fundamental way in which they achieve water and ionic balance in their blood is different from bony fish, and how they managed to tolerate fresh water was not known. The bull shark was difficult to maintain in captivity under experimental conditions. But I persuaded Dr Maetz that the sawfish would be suitable for experimentation, provided I could find small ones somewhere in the world, and bring them back to his laboratory alive. And we decided that the rivers of Senegal would be where to find them. Back then such “pure research” still attracted funding, but the balance has shifted. Such a project would only survive today on the merits of its application, perhaps somewhere in the field of medicine. Today fundamental research into subatomic particles is funded by billions of dollars, but you’d be hard pressed to find many other fields in which pure research is supported without a demonstrable application. On 15th October 2017 I set out with my son Dominic for Dakar, the capital of Senegal, where I was based 44 years ago. It took a day to get there. In June 1974, it took me the best part of 10 days to reach Dakar. It took weeks to gather the equipment in Cambridge. I assembled a mini-laboratory to gather blood samples in the field, centrifuge them, transport them frozen and analyse the basic blood parameters. There were boxes of syringes, needles, pipettes, graduated cylinders, reagents – even a small flame photometer. All of these were hauled on and off trains, until I found my vessel in Marseilles. 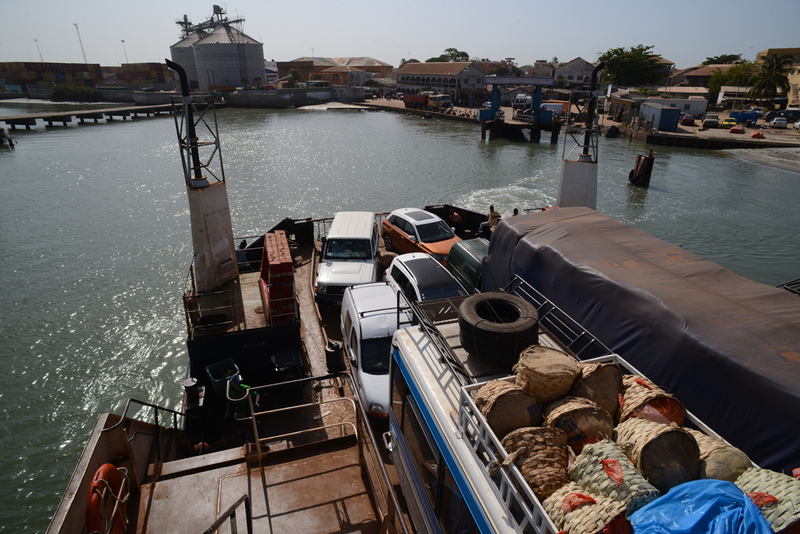 Days later we docked in Dakar. I was hosted at the ORSTOM-CRODT laboratory Senegal’s French-funded oceanographic research station at Thiaroye, just south east of Dakar. The laboratory was on the coast and had room for me to build holding tanks for the sawfish. It was a lovely location. The beach was clean, and I lived in a house among the casuarina trees. In October 2017, the first thing I did was to return to Thiaroye. The laboratory itself was long gone, replaced by a ragged line of properties along a rubbish-strewn beach. Such was the change on that coastline that I simply could not recognise where the laboratory had been. In fact, there was nothing in Dakar that even vaguely resembled the city of the 1970s. I could not get out of it soon enough, and a day later Dominic and I headed to the rivers of the south. In early 1974, I recall sitting in front of a panel of 12 scientists in Carlton House Terrace, trying to convince the Royal Society to give me a grant for the sawfish project in West Africa. “What language do they speak out there?” I was challenged. That was one of the most stupid decisions I made. I felt that the Royal Society had given me enough, and I did not want to ask for more. So, I sold my treasured motorcycle before leaving England and used the money to fund a second-hand Renault 4. Although way short of the four-wheel-drive vehicle I needed, that brave little car was phenomenal in the bush. I removed the back seat and crammed in a long-shaft 20hp outboard engine, a metal transport tank built to hold two sawfish, a 50m net, fuel for the boat, the portable centrifuge, a custom-made cool box, and all sorts of other equipment, food and water, plus a passenger. How the fully laden car survived the punishment of those roads, I have no idea. During our October 2017 expedition we hired a four-wheel drive Suzuki from Dakar. In air-conditioned comfort we cruised south along a reasonably well metalled road. 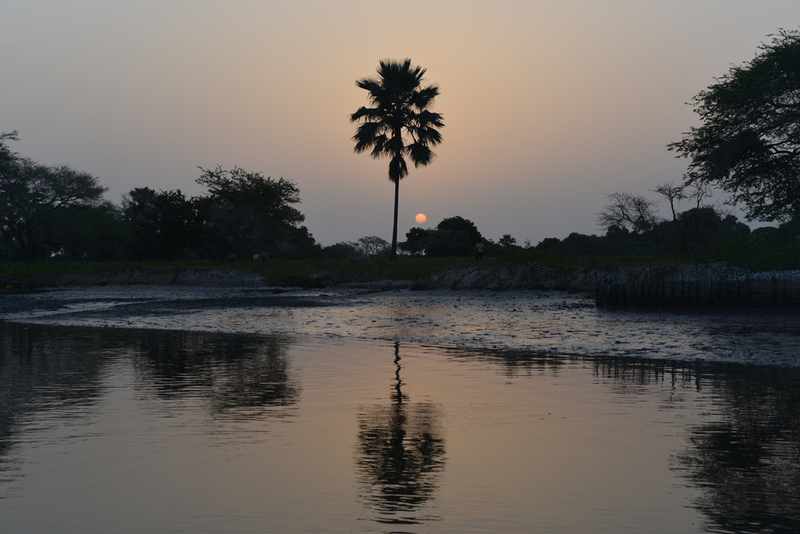 You cross The Gambia to get to the Casamance river in the south of Senegal, where I caught most of my sawfish in the 70s. This time, once over the into The Gambia Dominic and I turned east. I needed to return to an uninhabited village, Niani Maru, where in June 1975 a local fisherman had caught the biggest sawfish I witnessed in my research, a 5.64m female Pristis pristis. The North Bank road, once an endless stretch of dusty, corrugated dirt – or mud in the wet season – was perfectly paved. There was little traffic, and just the occasional donkey, cow or goat using the easy route from A to B. And a monotonous series of road blocks: police, immigration, forestry, army. Our passports frayed as they were thumbed through the endless checks. Our tempers were not long behind, but politeness ruled the day as bribe after bribe was demanded. That, indeed, was a change from the years before. In the days of GPS you would think its technology would get you around the most inhospitable parts of the world. However, when I returned to Senegal and The Gambia, I brought with me the old maps that I had sourced out there in the 70s. They were invaluable in getting us to the remote areas I had visited before. The roads had, of course, changed; tracks had disappeared. But without my 1:125,000 maps, produced by the Directorate of Colonial Surveys in the 1950s, it would have been a struggle. We found the track leading to Niani Maru on the north bank of the Gambia River and I am surprised that our four-wheel drive vehicle made it. Bushes scraped the sides; vegetation covered the track and we kept bottoming-out the vehicle. It seemed endless, and only the high forest lining the distant river gave us the confidence that we were headed in the right direction. How the Renault 4 had survived this, years before, I have no idea. Yes, Niani Maru has changed – a bit. We found the same river bank, slightly altered to prevent hippopotamuses from landing there, and the same trees where I had camped many years ago. That night the hippos’ bellows and splashing entertained me and Dominic, as they had his mother and me decades before. In 1975, a lone lion was still surviving in the area; we saw its pug marks in the river bank beside our camp. It has long gone, and perhaps too the giant sawfish that swam miles up the river to give birth to their young, 250km from the ocean. We’ll see. The search continues. In the 1970s, Nigel discovered a treasure trove of sharks and rays that were using the Casamance estuary in Senegal as a nursery ground. He also found an abundance of sawfishes. More than 40 years on and every indication is that the sawfishes in the region are all but extinct. Nigel is going back to find out if those indicators are right.